That figure would equal 90 percent of the estimated gross domestic product in 2020, up from 40 percent at the end of fiscal 2008. The baseline estimates contained in this document do not include the effects of the Patient Protection and Affordable Care Act, which was enacted on March 23, 2010. The President’s budget included placeholders for the budgetary effects of health care legislation; CBO used those placeholders in its analysis of the President’s budget. Translation: Because they didn’t have any specific ObamaCare data to analyze, they substituted phony data provided by the Obama Administration as “placeholders” in their analysis. When realistic ObamaCare data is plugged into the CBO econometric model, the debt will be far higher than projected. The people providing these placeholders to the CBO are the same ones who gamed the CBO score last week to make the unbelievable claim that the government can add a new healthcare entitlement to 32,000,000 people and it will lower the deficit. What could possibly go wrong? Heh! 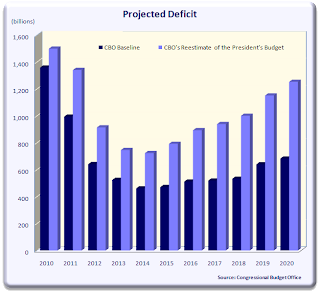 Obama, of course, has a history of grossly understating the deficits and debt being racked up by his administration. I’ll predict that next year at this time the CBO will project the 10-year debt to GDP ratio to reach 100% of GDP. All the rosy assumptions about economic growth upon which Obama and, albeit to a lesser extent, the CBO depend will never materialize. ObamaCare will only make things worse. Caterpillar and John Deere are already warning investors that the bill will take money out of their capital budgets, along with Verizon. And let’s not forget about the bond market. Update: The CBO has provided this helpful chart which illustrates their the 10-year budget projections. Again, as bad as these numbers look, their underlying assumptions are optimistic.